First published in 1938, this desktop science encyclopedia has been published in two volumes beginning with the sixth edition. It is edited by Douglas Considine and Glenn Considine. Distinguished in their respective fields of engineering and information management, they are also the editors of several other well-known technical reference books (e.g., Van Nostrand Reinhold Encyclopedia of Chemistry). Approximately 250 scientists, engineers, and educators from eight different countries contributed to this new edition. Van Nostrand's covers the six general areas of earth and space sciences, life sciences, energy and environmental science, materials science, physics and chemistry, and mathematics and information sciences. Where appropriate, entries have an identifying tag (e.g., Bond [Chemical]). The length of entries varies from one sentence (Aeolian Tones) to 11 pages (Climate). Only the longer entries are signed by their authors and have appended reading lists. The entries appear to be current. For example, Jupiter mentions the Ulysses satellite flyby of the planet in 1992, and 13 new readings have been added to its bibliography. Telescope has been expanded from 8 to 12 pages, has several new illustrations, and its bibliography is twice as long. This entry mentions the 1993 corrections to the Hubble Space Telescope. Similarly, the coverage under Television has been expanded to include a discussion of high-definition television, with mention of developments as recent as 1994. This work does not contain any biographies. Information on symbols and mathematical conversions is found under Units and Standards. This encyclopedia has a good history of revision. A comparison with the previous edition shows that about 200 new pages have been added to the text. There are approximately 7,300 entries, an increase of several hundred. Throughout the text are many appropriately placed black-and-white photographs, line drawings, tables, charts, and diagrams. In the past this work has been criticized for the quality of its illustrations. There are several instances in this new edition of attempts to improve the contrast and size of photographs. The index now appears at the end of each volume so the volumes can be used independently. A sampling determined that there are approximately 12,600 index entries and more than 5,300 cross-references in the text. This dual system of cross-references and indexing is barely adequate. The only comparable work is the McGraw-Hill Concise Encyclopedia of Science & Technology [RBB N 15 94]. It has 7,700 alphabetically arranged entries, 1,700 illustrations, and an outstanding index of 30,000 citations. More than 3,000 authors contributed to the work, and all articles are signed. There is a bibliography of databases and appendixes of conversion units, symbols and abbreviations, and a classification of living organisms. In addition, there is a list of important scientists. McGraw-Hill is clearly superior in illustration quality and indexing. In contrast, Van Nostrand's has almost twice the number of pages and longer entries than McGraw-Hill. 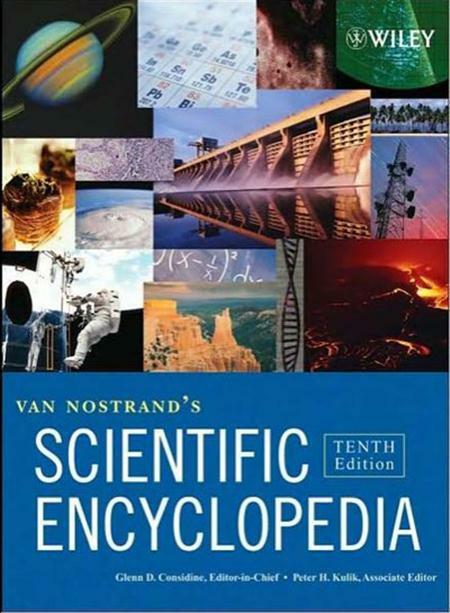 Academic, public, and high-school libraries should consider Van Nostrand's Scientific Encyclopedia for their collections. Van Nostrand's Scientific Encyclopedia 3 Volume Set Fast Download via Rapidshare Hotfile Fileserve Filesonic Megaupload, Van Nostrand's Scientific Encyclopedia 3 Volume Set Torrents and Emule Download or anything related.